A full analysis has been conducted of the sequences and secondary structures of viral type-I or related IRESs identified in all of the elements that correspond to the previously described minimal fragment of the enterovirus C IRES, which mimics the glycine tRNA anticodon hairpin in the IRES structure and is necessary for the specific binding of glycyl—tRNA synthetase. Experiments on human glycyl—tRNA synthetase binding with the mRNA fragments of several taxonomically distant viruses showed that the binding constants of these complexes are similar. These results indicate that the regulation of translation initiation via glycyl—tRNA synthetase must be a universal mechanism for these viruses and the corresponding parts of their mRNAs must have similar spatial structures. Furthermore, at least one additional mRNA hairpin with the glycyl anticodon loop has been found in all analyzed viral type-I IRESs. It seems plausible that this extra hairpin is associated with the second RNA-binding site of the glycyl—tRNA synthetase dimer and stabilizes its complex with the viral mRNA. Original Russian Text © E.Yu. Nikonova, A.O. Mihaylina, M.S. Nemchinova, M.B. Garber, O.S. 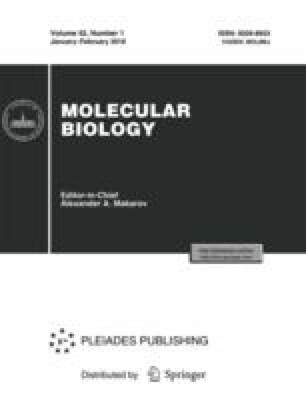 Nikonov, 2018, published in Molekulyarnaya Biologiya, 2018, Vol. 52, No. 1, pp. 10–18.